Are you looking for the next job in your pilot career? Whether you’re just starting out or you’re looking to take your career to the next level, you’re going to need a perfect resume to secure this upcoming job interview. However, as a pilot, there are going to be a lot of different details that you need to include than your typical job roles, such as a supermarket shop assistance or waiter in a restaurant. 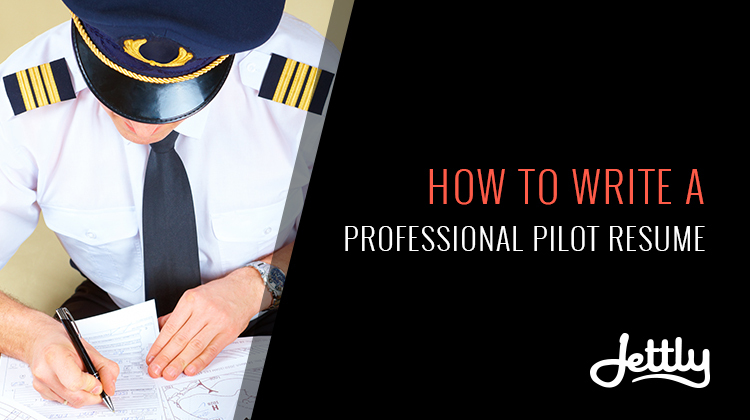 So you don’t miss out on this upcoming opportunity, or any future opportunities here’s how to write a professional pilot resume. Right at the top of your resume, you’ll need to start with the important contact details that all resumes should start with. This includes your name, your physical address, your main telephone number, your email address, your date of birth and your nationality. It’s important to put this at the top of your resume, so your recruiter can easily identify your resume and has all the information they need to get in contact with you, vital when it comes to getting in contact to ask you questions or to offer a job interview! As with resumes for any industry, it’s important that you create a custom resume for each job vacancy that you apply for. After your contact information, the first thing you’ll want to write about is your objective. This means saying something along the lines of ‘It is my objective to obtain a full-time position as a Captain for Emirates Airways’. This shows that the resume is unique for the application that you’re applying for and makes it very clear what the job is that you’re after. This is where a custom pilot resume really starts to stand out from the rest. Firstly, you’ll want to highlight the number of hours that you’ve flown in a similar position to the one that you’re applying for. If you have no similar position, you’ll need to start your flight hour history list with the most important first. “As you can see, breaking your flight time in different sections makes it a lot easier for your employer to know exactly what your experience is, making it easy for them to see whether or not you fit the role,” shares Duncan Smith, a resume editor for EliteAssignmentHelp. In the next section of your resume, you’ll want to briefly describe your work history as well as what qualifications you’ve got under your belt. This only needs to be a brief bullet-pointed section that will describe your flight experience as well as any licenses you hold that means that you meet the vacancy’s recommendations. Resume Writing Service – An online website with resume writing guides and templates you can download and use for a properly formatted resume. Via Writing – An online blog full of blog posts and articles you can use to improve your grammar skills when writing your resume. Essay Roo – A writing service that is home to a wealth of professional writers. State of Writing – An online blog with a tonne of writing rules and guidelines you can follow to make sure your resume is written professionally. Essay Writer – A website is full of resume writing guides to make sure your resume is perfect, as featured by the HuffingtonPost in “Write Me An Essay” post. Easy Word Count – A free online tool you can use to track and monitor the word count of your resume actively. UK Writings – An online writing service which creates from scratch, or edits your existing resume, on your behalf. Cite It In – An online bibliography tool for creating quotes and testimonials to your resume. Grammarix – A free grammar checker. As you approach the end of your resume, it’s important that you continue to provide your recruiter with valuable information about yourself. In the case of a pilot, this will come in the form of your pilot education and training that you’ve had. You’ll want to include all the information on which degrees you have completed as well as which university you actually attended. However, you won’t need to go as far back as to include high-school information or college; it simply isn’t relevant. However, you will need to include information on the last official training program that you went on as well as information on the last flight that you flew on, including dates and on-board roles and responsivities. Mary Walton is an editor at Big Assignments, an educational website for Australian students. She has a blog, Simple Grad, where she writes about online college services. Mary helps people with business writing at Paper Fellows, online writing service.